France, possibly the Loire River Valley, ca. 1460. Gold-tooled brown morocco by Zaehnsdorf, Ltd. Purchased on the Director's Fund, 1985. Virtue and Cahill Library, Portsmouth (no. 8420); London, Christie's, July 5, 1967, lot 166; Everett and Ann McNear, Chicago. Ms. nine leaves from a book of hours; written and illuminated in France, possibly the Loire River Valley region, ca. 1460. 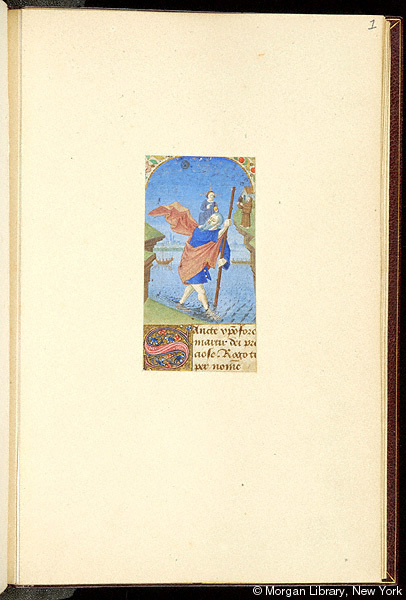 According to Eberhard König, these leaves and two others sold at Sotheby's in 1985 (London, Nov. 26, lot 5) were cut from a book of hours now in Florence (Bibl. Naz., B.R. 332)--Cf. Twenty-first report to the Fellows of the Pierpont Morgan Library. Artist: Master of Adelaide of Savoy, also known as the Master of Poitiers 30. Decoration: 9 miniatures, 16 marginal roundels, 18 full illuminated borders (2 cropped), 15 illuminated initials, 1 illuminated line filler; French Gothic style.